Next year, the Port Authority will begin a seven-year, $1.03 billion renovation of the suspension cables on the George Washington Bridge [PDF]. Announced in March 2014, the project includes new ramps to the bridge’s bike and pedestrian paths, eliminating stairs and a hairpin turn. But it won’t widen a bike path that is already too small for the amount of cycling traffic it receives. When both paths are completed, pedestrians will be directed to the south side of the bridge, while cyclists will take the north. At eight feet wide (6.75 feet at pinch points), both paths fall short of the 14 feet preferred by the Federal Highway Administration and the 16 feet recommended by the American Association of State Highway and Transportation Officials. The George Washington Bridge gets more than 500 cyclists and pedestrians during its peak weekend hours, by Weissman’s count. And cycling on the bridge is on the rise, increasing 32 percent from 2010 to 2014, even with today’s substandard conditions. 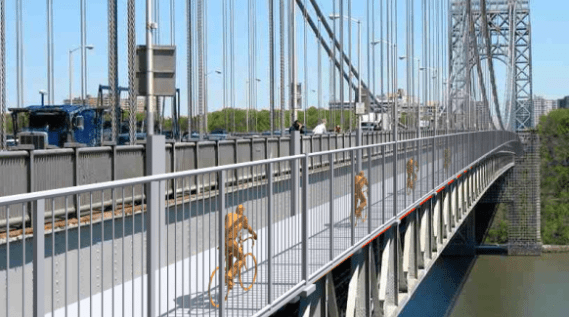 Weissman is not convinced that the Port’s plans for separate bike and pedestrian paths will work in practice — witness the frequent presence of pedestrians on the Manhattan bridge bike path. As the number of cyclists and pedestrians crossing the bridge continues to grow, Weissman is concerned that conflicts between the two will also increase. A path less than seven feet wide at pinch points won’t be good enough. Weissman has proposed maintaining the two existing paths for pedestrians and building two adjacent 10-foot paths for cyclists at a lower grade. He said Port Authority reps estimated his concept would cost $90 million. Weissman has been calling on the Port Authority to adjust its plans for the paths since 2013. He’s won the support of cycling clubs, bike shops, and elected officials from across the region, including a group of 11 Congressional representatives led by Charles Rangel and Carolyn Maloney, who sent a letter to the Port Authority echoing the request for wider paths [PDF]. In the City Council, transportation chair Ydanis Rodriguez has introduced a resolution with eight co-sponsors calling on the Port Authority to widen the paths. Testifying at the Port Authority’s September 2015 board meeting, Council Member Mark Levine, who represents a part of Manhattan just south of the bridge, said that the existing paths are “not adequate, even at today’s level of usage” and argued that the recabling project was “the perfect time” to upgrade the bicycle-pedestrian facility. When asked for comment on the bridge path plans, the Port Authority referred to a statement from Transportation Alternatives and the NJ Bike Walk Coalition supporting the project’s ADA and ramp improvements [PDF]. You said you *commuted* for three years. You worked weekends? I’ve returned across the GWB on any number of Sat-Sun afternoons with the East bound return lanes bumper-to-bumper. That’s why the PA charges peak pricing. And physically, if you were to block off a lane for Sat-Sun mornings and afternoons, how would you manage it? What lane would you put it in? How would you cover over the expansion joints which could swallow a bike wheel? Can you site an existing example of movable barrier systems used to facilitate bike access? Laying down orange cones is a safety non-starter. > In March, PA Director of Bridges and Tunnels Cedric Fulton publicly affirmed to Commissioners GWB paths could be widened at any time. You mean, in this document? He also suggested that there are structural engineering issues with adding the paths. But no matter… if the bridge can be widened at any time, that contradicts the claim that we have to do it now because we’re building out the GWB for the next 100 years. Path widening can be done in 2028, or 2050, or whenever PA decides to spend the $90m to do so. In the meantime, the improvements they ARE doing are significant and could potentially double bicycle capacity if needed. > You said you *commuted* for three years. You worked weekends? I’ve returned across the GWB on any number of Sat-Sun afternoons with the East bound return lanes bumper-to-bumper. That’s why the PA charges peak pricing. Yes I’ve driven a lot on weekends. It’s nothing like on weekdays, where 40-minute waits to get on the bridge are common. The traffic problems you experience could be due to the dysfunctional cross-Bronx, which has only 6 lanes compared to 14 on the GWB. In any case… if traffic is backed up heading eastbound you could always take a westbound lane for bikes. > And physically, if you were to block off a lane for Sat-Sun mornings and afternoons, how would you manage it? This was suggested by NJBWC chair. Certainly easier problem than building out new structure for peak traffic that happens not 5-10x/week, but just 2x/week and then in the summer only. Except it’s not. Ped-runner traffic during peak periods is 15-25%. Presuming 10% will not stay on the pedestrian side — as traffic engineers and NY Road Runners (referred to in the letter you sited) have stated — the net effect on the cycling side of having a second path will be marginal at best. Certainly not enough to offset a projected doubling of bike trips between 2014 and 2024 when PA scheme is due to come online. – If 600 users per hour are insufficient to warrant widening the GWB now, then how much more crowded does it need to get? – If you regard the cost of a fix during recabling as too high, then what’s the likelihood that a standalone job, at far greater cost and disruption, will find acceptance later? – If 110 (now 130) bike clubs, shops and elected officials from across the region, including eleven members of Congress, are not adequate constituency to get this project moving, then who is? We all know it’s a rounding error on the cost of the project as whole. The most serious problem is the discomfort from the structural engineers. > If 110 (now 130) bike clubs, shops and elected officials from across the region, including eleven members of Congress, are not adequate constituency to get this project moving, then who is? It’s hard to predict how the political climate will change 30-50 years in the future. However, the laws of Physics are not going to change. Whatever structural problems there are with this design today, they will still be there 50 years from now. No matter how much the politicians want it to be so. > Presuming 10% will not stay on the pedestrian side the net effect on the cycling side of having a second path will be marginal at best. 1. Eastbound on one side, westbound on the other. 2. Free-for-all, anybody use any side. Anyway, it’s one friggin’ mile. Nobody said you have to have free-flowing bicycle traffic at 20mph. Heck, the cars are lucky to sustain 20mph during peak hours. don’t you know? Terrorists only operate at night. and on foot or bike. so the path has to close at night. If cyclists are in the outside westbound lane, how do you propose to get cars traveling at 40 mph across the bike lane it to access the PIPC? You can’t. Source? I counted as many 536 users per hour across the GWB in April. There’s no way to *manage* your way out of a manifestly inadequate facility. Particularly not one where you’re mixing children, skateboarders, runners and dog walkers with category racers and CitiBikes. Imagine managing Williamsburg Bridge volume of users with each side half as wide. That’s what the GWB will be like in 2024 under the PA’s current plan. > Source? I counted as many 536 users per hour across the GWB in April. Source is my experience that I only see crowds on warm sunny weekend days. OK, Spring/Summer/Fall. Once you count rain, that’s maybe 50 days/yr? Most of the times I’ve crossed the bridge on bike, it’s nearly deserted. > If cyclists are in the outside westbound lane, how do you propose to get cars traveling at 40 mph across the bike lane it to access the PIPC? That exit happens 400′ after the bridge touches ground. Within that 400′, you merge the bikes back out of the travel lane, and onto the planned ramp and overpass that will take bikes to Hudson Terrace in Ft. Lee. Since that ramp is not part of the bridge per se, there are no structural constraints on its width. The effect on cars would be the same as any other time the right lane is closed — i.e. minimal, and they can still get to the PIPC just fine. The point is this… even if 6% of Palisades commuters choose bikes, that will NOT result in 6% bicycle commute mode share over the GWB. Because the GWB draws auto traffic from regions far beyond the Palisades that people just won’t be biking in from. Growth of bicycle commuting among Palisades residents will mostly drive growth in weekday morning/evening bicycle demand. Currently, commuter demand is far below capacity. A fraction of what one experiences on the Brooklyn, Manhattan and Williamsburg bridges. 1. I will believe that bicycling overall in NYC is growing by 5%/yr (mostly for commuting). But why would that translate to 5%/yr growth for recreational NYC residents yearning to see a slice of NJ on the weekend? Which is the peak traffic we’re talking about here. 2. Exponential growth never lasts forever, and it’s often hard to know when the growth will stop. GWB weekend bike traffic forecasts for 2024 are worth about as much as Texas highway traffic forecasts for the same timeframe. Nice, but you’re still not addressing how you cover the expansion joints or pick up and put down the equivalent of jersey barriers. What if it’s sunny in morning but rainy in the afternoon? Labor involved? Cost? Upshot is you’re speculating on solutions that are more complex and limiting and expensive than just widening the paths. If the PA thought it was worthwhile, why aren’t *they* proposing it. Or better, why haven’t they done already? Current use already justifies a wider facility. And from 2010 to 2014, bike trips across the GWB grew 7.2% annually, or 50% faster than NYC overall. And that’s on a facility whose the level of service of “F”, which should be depressing growth if there was any alternative. NYC continues to build out its bike grid at 50 miles per year and bike share (Harlem by 2017) with a target of with the goal of raising bicycle mode share to 6% from 1.5-2%. So there’s no reason to think the trend won’t continue, if not accelerate. Under PA’s plan, the wider approaches will likely induce a spurt in demand. FWIW, here’s the FHWA chart on a widened paths. It also gives runners and pedestrians their own paths which should, hopefully, minimize cross-use use. It’s starts life with a grade of “A”, which is a responsible use of funds and maintains and acceptable level of service through 2030. At a 5% rate of growth, through 2040. Not extravagant by any means. Expansion joints: do the same as they’ve done on the sidewalks. This is not the first bridge with expansion joints that we need to get bikes over. Jersey Barrier: Use a moveable barrier system. They’re currently used for the Lincoln Tunnel, Tappan Zee Bridge, Golden Gate Bridge, I-93 carpool lane in MA, etc. The barrier could conceivably also be used to make a reversible car lane during the week. > What if it’s sunny in morning but rainy in the afternoon? You would move the barrier every weekend from Apr-Oct, rain or shine. > Upshot is you’re speculating on solutions that are more complex and limiting and expensive than just widening the paths. As has bee pointed out, that’s also an option for the future. As I said, these projections are problematic. What I think is tripping us up is that peak bike demand on the GWB is weekend leisure travel, whereas we are used to thinking about situations where peak demand is weekday commuting. That difference is leading to the problematic projections. The discussion here is a design for PEAK bike traffic, not AVERAGE bike traffic. So now we take an increase in average traffic and blithely apply it to peak traffic. Doesn’t work. Almost certainly, the increase in average here is a sign of increased commuting to/from Palisades towns (which happens 365 days/yr, not the maybe 50 days/yr of leisure travel). Who has the stats on past changes in weekend afternoon bike trips, i.e. the peak that matters here? > NYC continues to build out its bike grid at 50 miles per year and bike share (Harlem by 2017) with a target of with the goal of raising bicycle mode share to 6% from 1.5-2%. That will continue to result in growth of commuter (currently off-peak) traffic. Maybe someday that traffic will rival leisure (peak) traffic. But it does not today, and has a long way to go. As for future increases in peak (leisure) traffic… Does anyone here seriously believe that 6% of traffic on the GWB on weekends will eventually be roadies heading to Nyack for the afternoon? Or that this activity has the capacity to grow at 5%/yr? Or that the improvements in the bike network mentioned above (especially the new TZB crossing) won’t result in leisure travelers choosing a wider variety of routes for their Saturday afternoon spin, possibly lessening peak weekend demand on the GWB? If commuter-peak travel is ever 6% of GWB traffic (doubtful for the bridge as mentioned above, even if regional bike mode share gets to 6%), then that would justify repurposing one of the 14 lanes for bikes. > At a 5% rate of growth, through 2040. MB systems are significant undertakings used to shift middle lanes to accommodate morning-evening rush hours, not outside lanes in the manner you envision. You’re not going to persuade anyone that a dubious option for sometime in the future is a workable substitute solution for widened paths — which could be online as soon 2020 when the North Path re-opens. I agree that the discussion is for peak use. And that’s what FHWA guidelines call for when assigning a A-F letter grade. Which was what I did when performed street-level traffic counts. PA installed its own traffic counters three months after I showed them my date, but have yet to disclose the raw data from theirs — FOIA requests notwithstanding. I expect that if the PA ever did release the hourly results, it would show peak use to well in excess of FHWA-AASHTO thresholds for widening the paths *now*. But I have been able to do is pull projections of average use from what the PA publicly released in 2010 and 2014. Also, I have not accounted for the *induced* demand that will surely result from the PA widening the approaches — which should certainly expand the constituency of GWB bike-peds-runner without increasing supply. OK, let’s keep working to get peak stats. However, since the peak here is recreational, I’ll bet there is more elasticity in demand than for commuter peaks (where there is already a lot of elasticity). > I have not accounted for the *induced* demand that will surely result from the PA widening the approaches — which should certainly expand the constituency of GWB bike-peds-runner without increasing supply. Not true, the proposed changes do increase supply. Currently, the bottleneck is the hairpin turn on the south side approach, plus the excessively narrow approach on the south side. Eliminating those problems will increase the capacity of the entire bridge. No, they don’t. Current sections of the GWB narrow to as little as 4-5′. Whereas, I’ve been using 6.8′ all the way across for FHWA grading purposes — as if the improvements were already in place. Still an “F”. BTW, you (and others) should feel free to reach out to me. So you mean… the planned improvements do not increase supply beyond that proposed by the planned improvements. Sorry, say what you want. But my experience was always that commuting over the GWB is far preferable to the Manhattan, Williamsburg, Brooklyn, Queensboro bridges, Henry Hudson and University Heights bridges. And of course better than the Verrazano Narrows. Really, the GWB is one of the best bridge experiences around, IMHO. That makes sense. Nevertheless there’s a bit of “build it and they will come,” aspect to this, and considering the exponential growth of cycling within the city as a form of transportation the argument could be made for greater than what strikes as a patchwork solution when considering the overall fiscal impact. No argument about Henry Hudson and University Heights. But, if I may broaden the discussion, that’s one of the selling points for a robust GWB, it helps makes the case for building out the Harlem River bridges and connected paths through the Bronx. Key reason why BXCBs #4, #5, #7 and #8 passed resolutions in support. Following your shortsighted logic, you don’t NEED to live in New Jersey and work in New York. Luckily, you aren’t involved in planning. The higher fence is very welcome. For cyclists the wider path is clearly welcome. As I recall the 59th St bridge has similar issues, although not as scary as GW. Improvements are long overdue and best to get it right this time, a just spend what is required. 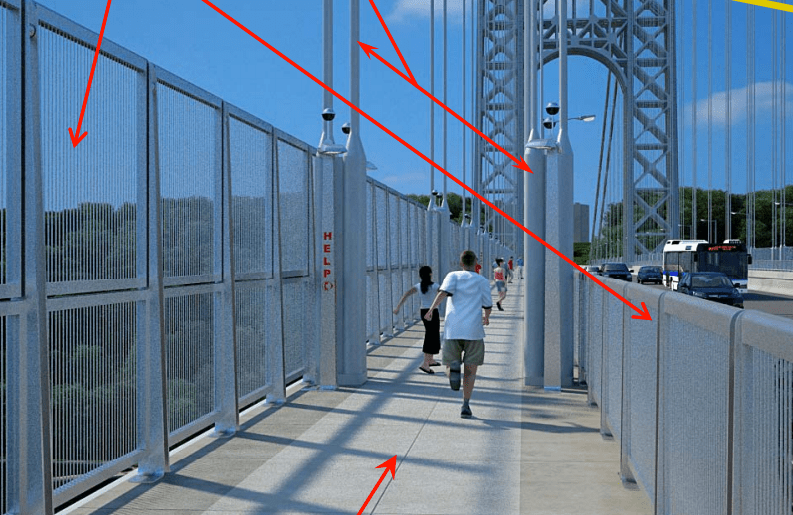 The Port Authority announced plans yesterday to add some breathing room for biking and walking around the towers on the George Washington Bridge. Currently the paths narrow and jog around the towers at tight angles -- the new "wedges" will make for a more comfortable ride. On Thursday, the Port Authority board will vote on the agency's $32 billion, 10-year capital plan -- which currently does not include widening the walking and biking paths on the GW Bridge. The paths are much narrower than engineering standards recommend, and with cycling numbers increasing at a rapid clip, the space crunch will only get worse.